The Wrecker (Dirk Garthwaite) is a fictional character, a supervillain appearing in American comic books published by Marvel Comics. Created by Stan Lee and Jack Kirby, the character made his first appearance in The Mighty Thor #148 (January 1968). Dirk Garthwaite first appears in the title Thor, and is depicted as a former manual laborer for a demolitions crew who is fired for his violent and anti-social tendencies. Garthwaite creates a costume for himself and adopts the alias the Wrecker, committing a series of robberies, demolishing looted locations and leaving a crowbar at the scene of the crime. The Wrecker enters a hotel room occupied by Asgardian god Loki, the adopted brother and arch-foe of the Thunder god Thor. Upon knocking out the depowered Loki, Garthwaite puts on his helmet, receiving an enchantment from Loki's ally, Norn Queen Karnilla, who assumed he was Loki because Garthwaite was wearing his helmet and she only saw him from the back. He is granted superhuman strength and stamina courtesy of his now indestructible crowbar. Reveling in his new found power, the Wrecker embarks on a crime spree and defeats Thor, who at the time has had his power severely reduced by father Odin (ruler of the Norse gods) as punishment for choosing to remain on Earth. A building is collapsed onto the Thunder God, nearly killing him. The Wrecker is defeated by the female Asgardian warrior Sif, who animates the armor of the Asgardian Destroyer to save Thor. His crowbar is shattered. The character returns to the title Thor and battles Thor once again, although a fully restored Thor easily defeats the villain. The Wrecker returns in the title The Defenders, and on this occasion appears with three superpowered partners in crime: Thunderball, Bulldozer, and Piledriver. Empowered when holding the crowbar as it is struck by lightning, the villains join the Wrecker to become the Wrecking Crew. While searching for a gamma bomb built by Thunderball with which they hope to extort New York City. The Wrecking Crew encounter and battle several members of the Defenders: Doctor Strange; Nighthawk and the Hulk. Aided by Power Man, the heroes defeat the villains. After an appearance in title Fantastic Four as the pawn of villain the Puppet Master, the Wrecker and the Crew feature in the title Iron Fist in a battle against heroes Iron Fist and Captain America. The Wrecking Crew reappear in Thor against the Thunder God, but are quickly beaten. The Wrecker appears with the Wrecking Crew and other villains in the limited series Secret Wars; battles Spider-Man and teammate Thunderball over control of the Norn power in the title Spectacular Spider-Man; and joins the fourth incarnation of supervillain team the Masters of Evil in a raid on Avengers Mansion. With the Wrecking Crew and other villains, the Wrecker savagely beats the Avenger Hercules before being captured by the remaining Avengers. The character features in the title Iron Man during the Acts of Vengeance storyline; and in Thor has several battles alongside The Wrecking Crew against Thor, Hercules, the superhero team Excalibur, and Ghost Rider before being defeated. The character also receives instruction from another opponent of Thor, the Asgardian troll Ulik, as to how to utilize the full power of the enchanted crowbar. 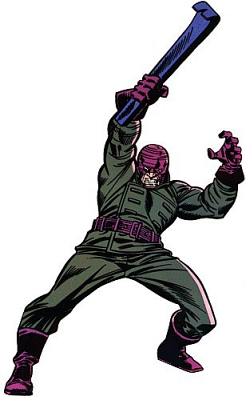 After an appearance with other villains in the title Captain America, and with the Wrecking Crew in Alpha Flight, the Wrecker features in Thunderstrike and reunites with the Wrecking Crew in Journey into Mystery. After an appearance in flashback in the first issue of Thunderbolts, the character appears in the second volume of Marvel Team-Up against Spider-Man, Namor the Sub-Mariner; Doctor Strange and Iron Man, then makes an appearance in Thunderbolts and with the Wrecking Crew battles the Avengers. With the Wrecking Crew the character features in Thor and battles the Warriors Three the Thunder God; and has a brief appearance in the title Wolverine and then Avengers, which features a grueling battle that leaves a civilian dead. The Wrecker appears in the title She-Hulk; in flashback in Avengers Finale and the New Thunderbolts. The character becomes a perennial foe for the Avengers and features in the title New Avengers; New Avengers: Most Wanted Files; briefly in New Excalibur and with the Wrecking Crew battles Canadian superhero team Omega Flight in the title of the same name. After an appearance in the second volume of She-Hulk, the title New Avengers reveals that villain the Hood has hired a small army of criminals, which includes the Wrecker (taking advantage of the division in the superhero community caused by the Superhuman Registration Act) In the title Daredevil and at the Hood's direction, the Wrecker battles fellow criminals the Enforcers and the New Avengers. The character and the Wrecking Crew feature in a short story in the second volume of Marvel Comics Presents; then in Punisher War Journal; the limited series 1985 and with the Hood's army in the Secret Invasion storyline battling the alien Skrull force invading New York City. The character continues to make appearances across several titles as an employee of the Hood, including New Avengers; Captain America; limited series Marvel Apes and a promotional comic titled Thor, produced by fast food chain Taco Bell. Together with the Wrecking Crew the character features in the alternate universe title What If? ; Dark Reign Files; in flashback in Incredible Hercules and stories that form part of the Dark Reign storyline. He was seen among the Hood's men in the attack on Asgard. During the Avengers: Standoff! storyline, Wrecker was an inmate of Pleasant Hill, a gated community established by S.H.I.E.L.D. Wrecker is then seen among a group of super villains who hear from Wizard that Doctor Doom had gone straight, only for Doom to arrive and defeat them singlehandedly. Wrecker is later seen in S.H.I.E.L.D. custody, where he is interrogated by the Thing. Wrecker and the rest of the Wrecking Crew are seen as a member of Hood's gang as the Wrecking Crew led the attack on Castle Doom. Wrecker and Thunderball are taken down by Doctor Doom in his Iron Man armor until the Hood showed up with the rest of his gang and shot him with one of his enchanted bullets. As Rampage and Shockwave held him down, Wrecker was ordered to rip open Doctor Doom's Iron Man armor. As Wrecker prepares to do the final opening move, Victor von Doom disappeared in a bright light leaving the armor behind. Courtesy of an Asgardian enchantment on a crowbar, Dirk Garthwaite possesses superhuman strength, stamina and durability (bulletproof). When he initially shares the Norn power with the Wrecking Crew, the Wrecker's abilities were reduced by one-fourth. After training from Ulik the troll, the Wrecker no longer suffers from this handicap and is now capable of using his powers to their full potential and use the crowbar in the same fashion that Thor can utilize the mystic hammer Mjolnir. He has used the crowbar to demolish entire buildings in minutes and to hold off the thunder god, Thor, in battle. Wrecker primarily uses the crowbar offensively as both a throwing and blunt weapon. The crowbar's secondary abilities include absorbing and projecting energy, creating illusions, generating a force field, creating minor earthquakes, teleportation and returning to the Wrecker when thrown. The Wrecker also shares a mental link with the crowbar, and can mentally control any weak minded individual touching the object. The Wrecker is the most powerful member of the Wrecking Crew and while many believe his crowbar is the source of their powers (Thunderball thought that when he attempted to steal the crowbar, until his hand was crushed by The Wrecker in a "friendly" hand-shake while the crowbar was in Thunderball's possession), it is The Wrecker himself that is the source of The Wrecking Crew's powers, especially after Ulik's training. The first Marvel super-villain known as the Wrecker fought Giant-Man and the Wasp in Tales to Astonish 63. He was a two-bit shake-down artist who wore a hood and used DDT and bear traps for weapons. Even at the time, Stan Lee knew this villain wasn't up to par: "Can we confess something to you? We feel 'The Wrecker' was kind of a weak Giant-Man tale!" There was also a man named Karl Kort who went by the name "The Wrecker" in issue 12 of The Fantastic Four. This issue is also famous for depicting the first meeting between the Fantastic Four and the Incredible Hulk. The simian Wrecker and his mystical monkey-wrench were vital to the defense of his home dimension from flesh-hungry zombies. While the Wrecker himself fell to the zombies early on, his weapon was used by trans-dimensional travelers interested in saving innocent lives. Wrecker (alongside the other Wrecking Crew members) appears as a member of Hood's Masters of Evil. This version of the character first appears in the Ultimate Marvel imprint title Ultimate Spider-Man as a member of Damage Control, before he went villainous. The Wrecker appears in The Super Hero Squad Show episode "To Err is Superhuman", voiced by Charlie Adler. The Wrecker appears in The Avengers: Earth's Mightiest Heroes episode "Thor the Mighty", voiced by JB Blanc. The Wrecker appears in the Ultimate Spider-Man episode "Damage", voiced by John DiMaggio. The Wrecker appears in Avengers Assemble, voiced again by John DiMaggio. In the episode "Hyperion", he was seen trying to rob an armored car and fought the Avengers until he was defeated by Hyperion. When Wrecker later tried to leave town, Hyperion cuts him off and tried to eliminate him. The Avengers intervene as Falcon gets Wrecker far away from Hyperion. In the episode "Avengers: Impossible," Wrecker was seen with the Wrecking Crew in the middle of a bank robbery where they were defeated by the Avengers. Impossible Man frees the Wrecking Crew so that they can fight Falcon in his TV show. Wrecker and his fellow Wrecking Crew members are slowly defeated by Falcon. The Wrecker appears in Hulk and the Agents of S.M.A.S.H., voiced by Steven Blum in "The Skaar Whisperer" and by Fred Tatasciore in "The Big Green Mile". The Wrecker appears in the Marvel Disk Wars: The Avengers episode "Mutant Girl Awakening", voiced by Takahiro Miyake. The Wrecker appears as a mini-boss in the Sega Genesis version of Spider-Man. Wrecker was originally going to appear in the SNES version, but was cut for unknown reasons. The Wrecker (alongside the other members of the Wrecking Crew) appears as a mini-boss in Marvel Ultimate Alliance, voiced by Dave Wittenberg. The Wrecker appeared as a mini-boss in Marvel: Avengers Alliance. This page was last edited on 16 February 2019, at 13:35 (UTC).